For a healthy diet you need to include in your diet organic food. The dishes too are requirements, allowing to save useful properties of products, their flavor and color. This is achievable with the use of utensils of the company "Zepter". For example, vegetables and seafood without the use of well water to cook and will retain their vitamins. And the meat and fish you can fry without oil and they will not burn. This greatly reduces the caloric value of the prepared dishes and it is important for those who are watching their health and weight. Take the saucepan and close the lid. Put the saucepan on the fire and heat to such a temperature so you can fry the meat. You will determine the direction of the special thermal device inserted into the lid of your pan. The arrow should be at the beginning of the green fields. Adjust the provision in an electric stove the amount of heat and fire in a gas stove. At the bottom lay the prepared meat pieces, spread the pieces, press them with a fork and close the cover. Fry for 5 minutes on each side until Golden brown. For cooking fried fish a saucepan to heat up should not be! The fish lay on the cold surface of the cookware. Spices, salt, onion and other ingredients of your dish, put on top of the fish. Close the cover, make sure that the needle reached the middle of the green fields and turn off the fire. For soups, the pan should also not be reheated. Bookmark products need layers, starting with juicy fruits, and then add cold water. Cook the soup for 25-30 minutes at the location of arrows in the middle of green fields. 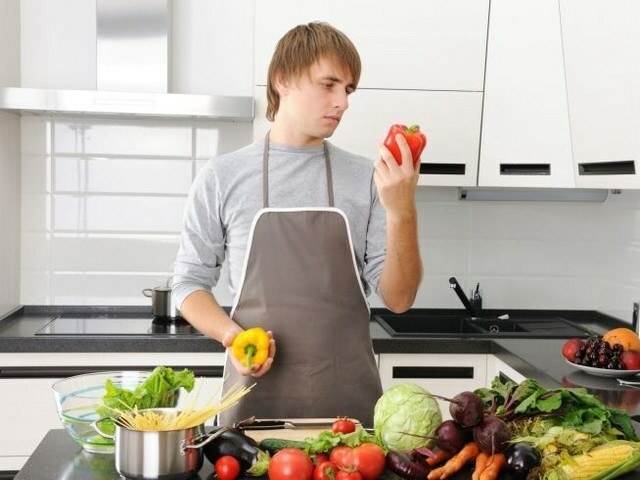 To prepare the vegetables, put a pot on the stove and for heat, fill 2/3 of the total volume, and then close the lid. Wait for heating the pan to the cursor position at the beginning of the green fields. Cooking vegetables is to achieve the arrow tool mid the green fields. Turn off the stove. Wait 10-15 minutes, your vegetables are ready. Please note that the dishes Zepter food is cooked much faster than in any other. Be careful that your products don't burn or have not lost their properties, i.e. not peredergivaete them in a pot on the fire. For uniform heating put the dishes Zepter first on a small fire, and then strong. To passed uniformly, ensure the temperature in the pan is not dropped – do not lift the lid too often. 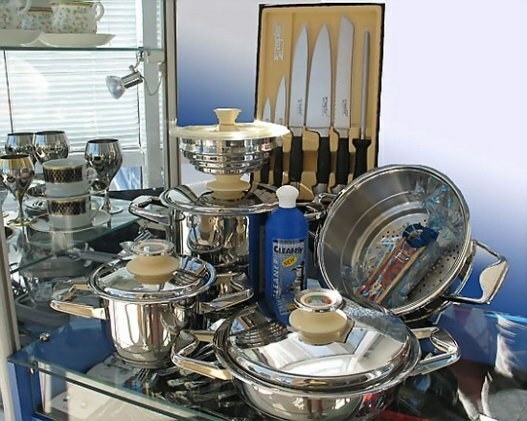 All cookware company Zepter is made of stainless, high strength and high quality steel. The products of this company conform to all standards. The food cooked in it is the key to a healthy diet. Pan of firm Zepter specially made for cooking healthy fried food. Dishes are tasty and delicious, because nothing sticks, not burnt. The firm uses technology from URA to create a non-stick coating. The pan is made from durable steel, which is environmentally safe, does not alter the smell of food, not subject to corrosion and destruction. The polished surface makes it easy to wash the dishes that ensures proper hygiene. At the bottom of the pan are exposed pyramid, they do not allow foods to stick. Difference frying Zepter is a thin heat storage the bottom. This property allows the pan to heat up quickly. With this dishes you can cook on modern stoves. Surface polishing makes the dish smooth. Washing dishes is a pleasure. You can purchase pans of different sizes, with cover and without. Cooking in the pan from Zepter is possible without oil. In this case, the food will not stick, will not contain many calories, so is suitable for those who follow health and weight. You need a pan put on fire, to ensure that the flame does not go beyond the edges of the dish. Before roasting meat, the pan should be warm, then it will not stick to the sides and bottom. Before frying the products should be salt and pepper. On the lid of the fryer has a thermostat, it is possible to judge the warm-up dishes. The meat should be put on the bottom, press lightly with a fork, and fry on each side for 5 minutes until Golden brown. The fish need to put on a cold pan, then it will not stick. On top you can put onions, carrots, season with spices. Very quick to cook the vegetables. You need to fill the dishes 2/3 full. Vegetables should be put in cold dishes. Wait until the pan heats up, wait five minutes and turn off the stove. Then let stand another 10 minutes. Dishes cooked in this dish, different taste. Products do not fall apart when frying, remain solid well-done pieces. If someone in the family does not adhere to a healthy diet, hates diet food, you can fry in a pan with butter. Such dishes are just as tasty, only with a lot of calories. Zepter cookware is durable as well as scratch resistant. Can food stir all attachments without fear of damaging the surface. For the manufacture of detergent do not use chemical coatings, all the materials are safe for health. Previously the non-stick coating was made on the basis of PTFE - polytetrafluoroethylene. Which was later recognized as harmful. Cooking in a pot entails health problems and even the emergence of certain diseases. But modern technology URA has revolutionized the manufacture of cookware.